I am attracted to destinations whose names are fun to say. Luang Prabang. Nuku’alofa. Malapacao. Waga Waga. Saskatoon Saskatchewan. And so it was with Saas-Fee. At the end of a long ride across the center of Switzerland on the incongruously named “Glacier Express” (plodding views of fog and rock), we were faced with a y-shaped valley offering the choice of either Zermatt or Saas-Fee and Saas-Fee was judged to be the more fun to say. Moreover, what we had read about Saas-Fee promised one last chance to see one of the alleged glaciers up close. Good enough. After a short ride on a snazzy yellow postal bus we were presented with a view of the town of Saas-Fee squatting at the head of the valley and embraced on three sides by high, snow-capped, mountains, as if in a massive amphitheatre. Italy lay just ten kilometers to the south, over Mount San Martino; Zermatt was a similar distance to the west, over the Alphubel; and I’m sure something really interesting was to the east, over the Fletschhorn. A fetching view. We humped our packs down the steeply canted streets from the bus terminal in search of the youth hostel. Saas-Fee appealed to me immediately because cars were banned from these streets, but the hostel proved exceptionally difficult to locate as they had apparently also banned signage. As we had no map we resorted to systematically combing the town, like someone looking for a dropped ring in a field. Fortunately Saas-Fee was a tiny place and we eventually located the hostel in the far corner of the town where it curiously occupied the middle floor of a generic apartment building and was marked by a sign the size of a passport photograph. It was difficult to know how to respond to that as he said it in a way that sounded like he was reading from a royal proclamation. “Um, hi, I’m Philipp and I am…” I glanced at Mark, my traveling companion, who shrugged, “… a student.” I shook Peter’s hand. “And hi, I’m Mark and I am, er… also a student.” Mark shook Peter’s hand. Peter beamed at us and, after the usual where-are-you-from-how-long-are-you-traveling pleasantries, gave us a rundown on “alpinism” and his plans to climb some of the nearby peaks as well as get it on with the Australian girls. Actually, despite his quirky flair for being inappropriately dramatic about almost everything, he was quite a pleasant and agreeable fellow. It was clear that behind the macho bluster was a geek who used to get beat up at school just like us. We ex-geeks have an unspoken natural affinity for each other. Peter suggested we go to a shop around the corner that would be closing soon in order to get supplies for dinner. The local restaurant scene was fantastically over-priced - positively daffy really, like twenty dollars for French fries - and the hostel had a kitchen, so this seemed a sensible enough plan. The three of us shared a meal of spaghetti (“Starch is essential for the serious Alpinist.”) and a bottle of red wine. Peter rapidly became drunk and incoherent but couldn’t work up his courage to make a pass at the Australians, who had just come back in from doing something dauntingly sporty like peak-to-peak running into Italy, so we all went to bed early. The weather was shockingly good the next day. It had been raining for a week and we had resigned ourselves to seeing the Swiss Alps from the perspective of someone trapped inside a plastic grocery bag, so the sparkling sunshine and luminous robin’s egg blue skies were a joyfully received bonus. After a breakfast of chocolate and fruit (“Sugar is essential for the serious Alpinist.”) Peter headed off to go climb something while Mark and I decided to make for the glacier on the side of the Alphubel. The trail wound up from the town through a meadow so Swiss Tourism Bureau poster perfect that we felt compelled to stop every few meters and exclaim how wonderful it was and take pictures. Yes, the meadow was as implausibly green as new pool table felt and yes, the views back down to Saas-Fee were head-spinning, but the key feature, the feature that simply made this meadow, was the fact that it also was home to a Swiss cow. We had seen Alpine cows before in Austria, but this was an actual Swiss cow. 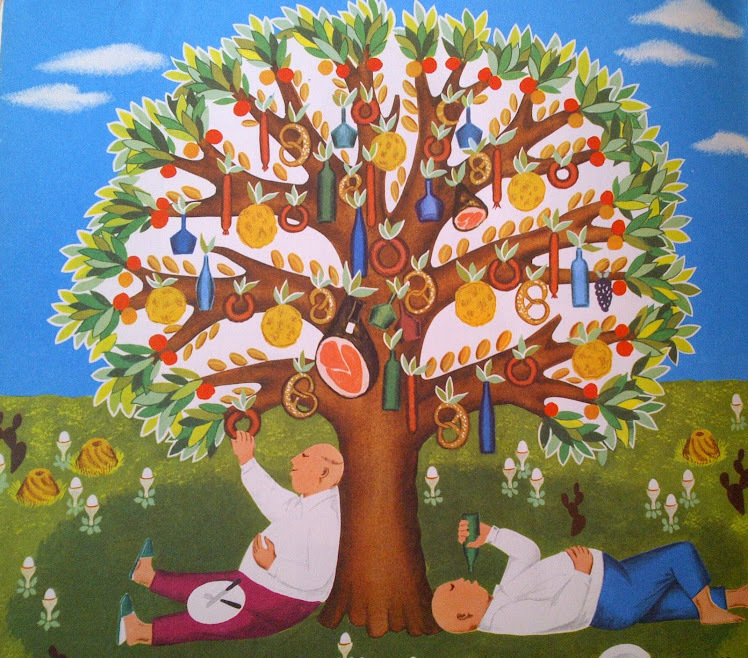 The difference is, to be sure, a subtle one – both are brown, both are passive, both have long eyelashes, both sport big brass bells hanging from ornately tooled leather collars – but to the aficionado there is nothing quite like the genuine Swiss version. We were positively burbling with delight. We took several photos of each other posing with the animal, which was entirely unmoved by our attention, and then stood around smiling like halfwits for a little while before moving on. The only downside to the day being so utterly perfect for a hike was that everyone else evidently thought so as well and the trail was infested with astonishingly zippy seventy-year-olds wearing dazzling knee socks and clutching elaborately carved walking sticks. I tell you, Switzerland is like catnip for old people. Fortunately though they were all headed directly up the trail to some stupidly distant and elevated pass or viewpoint whereas Mark and I veered off about halfway along to get right up close to the glacier and touch it. Ah, good old retrospect: in retrospect this was an idiotic thing to do. It didn’t occur to us that there might be a reason why no one else was ambling up to the toe of the glacier; we didn’t give it the scantest of thoughts. The other people were clearly idiots. We were clearly not idiots. We knew what was cool. Glaciers are cool to look at, ergo they must be even cooler to touch. Moreover, there were no signs telling us not to. Coming from North America this was significant encouragement as back there anything even vaguely hazardous was lavishly sign-posted. At the Hawaiian lava fields there are numerous signs that manage to be both humorous and ominous as they depict the universal stick figure capering into a big crack and falling into molten lava labeled “2000 F !!!”. The stick figure was expressionless as he met his igneous fate, but the implications were clear. Or so one would think – despite the arrestingly frank signage, hundreds of tourists could be seen meandering blithely right on past them. So, not being expressly warned of obvious danger, Mark and I trotted up to the end of the glacier, happy as any two simpletons let out for the day. From a distance the glacier was gleaming and milky white, the very visual essence of purity, but up close it was disappointingly grungy. It did not end in a gentle slope like a long tapering wedge, but instead abruptly like a… long tapering wedge whose tip has been broken off. 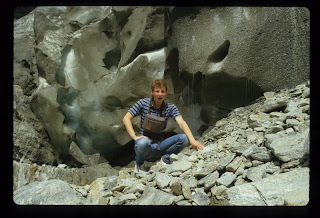 Arriving at the glacier we faced a three-meter high pitted and scalloped gray wall that afforded only glimpses of pale electric blue glacial ice flashing between the frozen dirt, muck and rocks. Glaciers evidently pick up all kinds of crud as they scrape along; then as the tip melts the water goes away leaving a higher and higher crud-to-ice ratio. Nonetheless it was still all rather spectacular and it was definitely a thrill to be in such close contact with an elemental force of nature that one normally does not have ready access to at home. What we hadn’t counted on though was what would happen as the day became hotter. It was a sunny July day and it was well into midday by the time we reached the glacier. And now here’s the funny thing: both our fathers were physicists and both of us had achieved top marks in science at school, but we were unable to put together heat + ice + chunks of stuff in the ice until Mark came within a few centimeters of being brained by a basketball sized rock. We had even heard the occasional “crrrraaack!” and had been admiring the melt-water pouring off the glacier, but really only when the bombardment was already underway did we begin to comprehend the folly of standing beneath a rock-studded glacier on a hot summer day. It was like being under mortar fire. The astonishing thing was how fast it all began. One second we were gawking and posing for pictures and the next second rocks and boulders released from the melting ice were hurtling through the air and threatening to put our travel health insurance to the test. Our reflexes were a bit sluggish, so we stood there, dazed, for a moment or two while our bodies sorted out whether this was a “fight” or a “flight” type of threat. Fortunately our bodies guessed correctly and we were off and running pell-mell down the slope before either of us could become an instructive news item. I will still occasionally get out the photo I was taking of Mark when the first rocks began to fly. The expression on his face with his mouth half open saying something like “Aaaah!! !” is absolutely priceless (see top of story). We ran until we were well clear of the glacial cannonade and then we ran some more. Finally we stopped, wheezing and panting in the thin high-altitude air, bent over with our hands pressed against our knees. “Whew… that… was…” pant, pant, pant, “really…” pant, pant, “dumb,” Mark gasped and then sat down on the meadow. “Yeah…” pant, pant, “yeah…” and I sat down too. After a few minutes of vacant staring and gradually lessening respiratory distress we began to chuckle, first Mark and then me. The chuckles turned into laughs and the laughs became convulsive roars and soon we were out of breath again and on the verge of tears. Near death experiences are such a hoot. Thus feeling better we decided to return to the main trail and join the senior’s procession higher up the mountainside. This turned out to be a refreshingly good idea as this brought us into viewing range of all manner of Swiss wildlife. Who would have thought that the Swiss would have wildlife too? But sure enough, there, a little ahead of us and to the left amongst some biggish boulders, were some sheep or goat-like creatures nibbling on lichens and recklessly bounding between invisible footholds like stunt animals. Subsequent study of my childhood wildlife picture books revealed these to be Chamois. I’m not entirely sure what the relationship between these lovely creatures and the soft cloths used to buff cars is, but I sincerely hope that it’s nothing too disturbing. As if the wild goat action wasn’t sufficient there were also marmots aplenty. I ask, who does not love marmots and who would not want to while away an afternoon where they are aplenty? They would pop up and down behind rocks and such like the plastic target animals at the fairgrounds, but, like the Chamois, they were far too charming to huck anything at. And then it got better. I know that it is a most grievous character flaw to take pleasure in another’s misfortune, but I don’t feel too guilty because he was definitely milking it for everything it was worth. Peter “I Am An Alpinist” Seisjener hadn’t bagged his peak. In fact he hadn’t even made a serious attempt as he had managed to ingloriously twist his ankle on the walk to the mountain. You’d think that would have taken the bluster out of him and made him sheepish and subdued, but you have to give the man full credit - Peter had managed to deftly turn ignominy and failure into a tale of daring and vulnerability, crafted in such a way as to push exactly the right buttons with the two Australian girls who were serving him soup and smiling at him tenderly when we came stumbling back in. From the look on Peter’s face you would have thought he had just conquered Everest on a pogo-stick. To further give him credit, after the girls had left, he was more than willing to laugh at himself and the three of us enjoyed a raucous evening of self-ridicule and cheap wine (“Alcohol is essential for the serious Alpinist”). Catnip for old people. I love it!